Hier noch ein kleiner Nachruf zu unserem Ausflug nach Laos. Mary hat das meiste wunderbar beschrieben, aber ich möchte auch noch ein Paar sätze dazu schreiben. Der Anlass für unsere Reise war Bjum Ben. Das ist ein Kambodschanisch – Buddhistischer Feiertag. Die Kambodschaner müssen in dieser Zeit in die Pagodas gehen um für ihre Vorfahren zu Opfern. Als Höhepunkt dieser 15 Tägigen Zeit wird das ganze Land “geschlossen”, sprich, ganz Phnom Penh verlässt die Stadt und geht Verwandte aufs Land besuchen. Des weiteren wurden dieses Jahr alle Firmen dazu aufgefordert ihren Mitarbeitern zusätzlich frei zu geben, damit jeder in seine Heimatsstadt gehen kann um sich für Wahlen zu registrieren. Man hat uns das sage und schreibe eine Woche im Vorraus gesagt. Irgendwie hat mich das an die Weihnachtsgeschichte erinnert. Die Freitage kamen uns aber gerade gelegen. Seit wir zurück sind von unserer Zeit und der Schweiz und den Staaten verbringen wir viele Zeit im Büro. Da kam uns eine Pause gerade gelegen. Der Bus nach Pakse im Süden von Laos, in der Nähe von der Kambodschanischen Grenze, braucht etwa 10 Stunden Fahrzeit und 6 Stunden Wartezeit und kostet ca 30$ für diese 600km. Um 6 Uhr morgens ging es los, etwa um 7 Gegen Abend sind wir an der Grenze angekommen. Wir haben eine beleuchtete Barriere im Mitten des Nichts angetroffen. Pässe wurden eingesammelt um die Visa zu organisieren. Ein Visa kostet so um die 35$. Ausser für Kambodschaner, Vietnamesen und… für die Schweizer war der Eintritt “gratis”. Keine Ahnung warum, aber ich glaube meine Schadenfreude hat sich kaum in Grenzen gehalten ;) Hat die Schweiz spezielle Beziehungen zu Laos? Muss ich mal überprüfen. Gratis war es dann am schluss aber doch nicht. 2$ für den Stempel auf Kambodschanischer Seite, 2$ für den Stempel auf Laotischer Seite, 2$ für den “service”. Standartkosten. Schon fast legalisiertes Schmiergeld. Übrigens, meine Mutter kommt in 10 Tagen zu mir. Ich freue mich oberriesig. 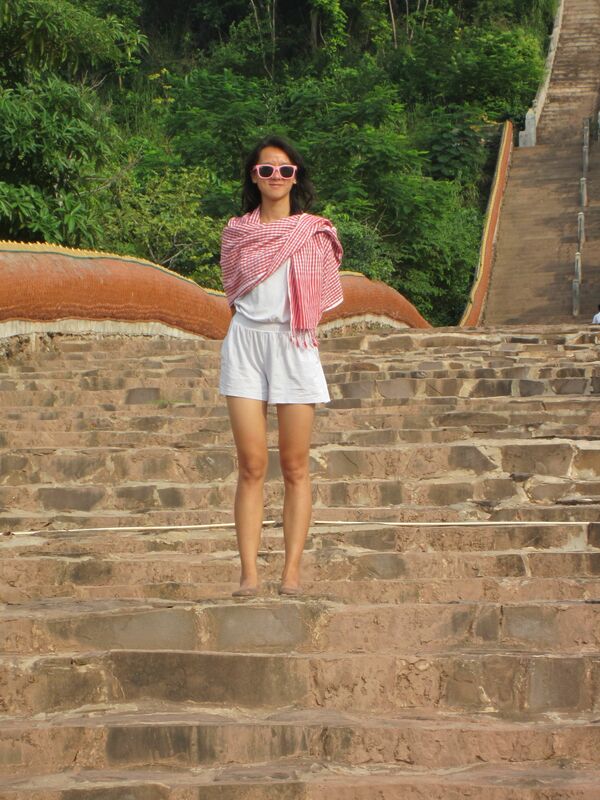 Further up North « Wandering through Cambodia (original Blog written by Mary Hui). Following an idea initially inspired by a former co-worker, Christoph and I hopped on a bus for a 14 hour ride to our neighboring country, Laos. 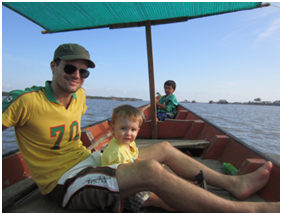 A couple of weeks ago, it was Pchum Ben in Cambodia and our company closed its doors for 3 days. Then the government, less than a week before the holidays, sent us a photocopied notice that demanded that the staff be given two extra days to travel back to their home province in order to register to vote in the local elections. Though it was frustrating for getting our projects done, it was not a problem for us since that would give us a solid 9 days in Laos. That’s me, wearing my vacation outfit. We left Phnom Penh at 6:45 am and arrived in Pakse, the biggest city in the south of Laos at 10 pm. We were dropped off at a dark bus station, far from the center of town and immediately we noticed a major difference between our home and Pakse. There were no tuk-tuk or moto drivers harassing us for a ride. In fact, I kinda wished someone showed interest and helped us find our guesthouse. We walked in the direction of the city and found internet in a nearby hotel. 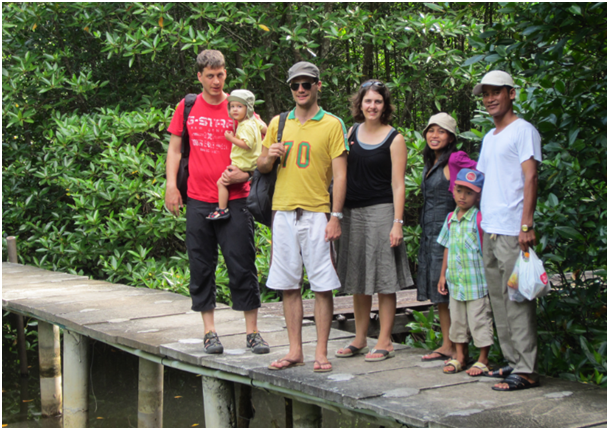 It was not long before we were in front of our homestay Imoun. A chubby woman had stayed up late waiting for us. She let us in and showed us around. It was a simple home. I think in fact, the name of the guesthouse wasn’t a joke. It was really a homestay. I never got her name but she served us delicious breakfast and treated us so well. There were no other guests on all the nights we stayed there. But seriously, for $10 a night, I would highly recommend her to anyone who is looking for a simple place with awesome hospitality. Also, did I mention that her sheets were the whitest sheets I’ve ever seen at a guesthouse. They looked like they were purchased yesterday from the store. 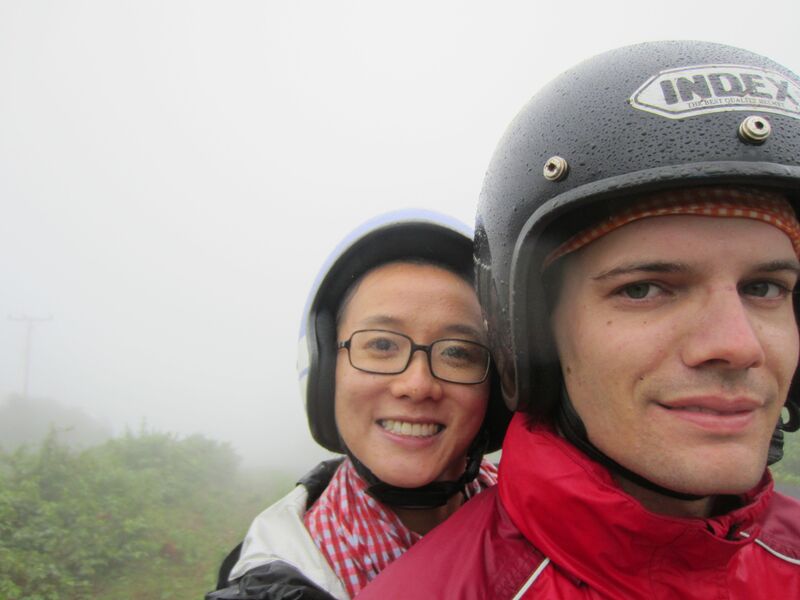 On the second day, we decided to rent a moto and drive a 300 km loop at the top of the nearby Boleavan plateau. 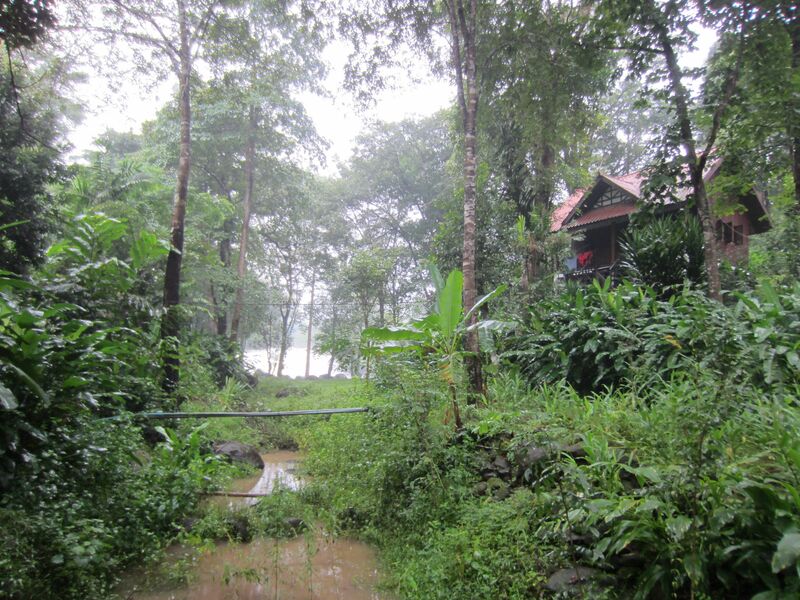 The plateaur is known for the tea and coffee plantations, waterfalls, and ethnic villages. We went the local market, bought $2 rain jackets in anticipation of the rain from the gloomy dark clouds. 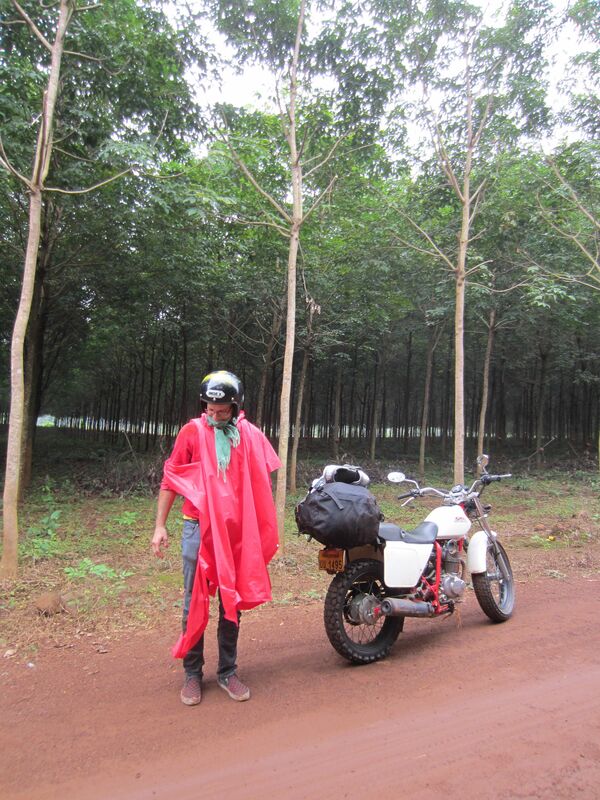 I was glad we bought it but cheap quality rain jackets from china don’t last so long in harsh conditions. That’s Christoph after driving only 1 hour. 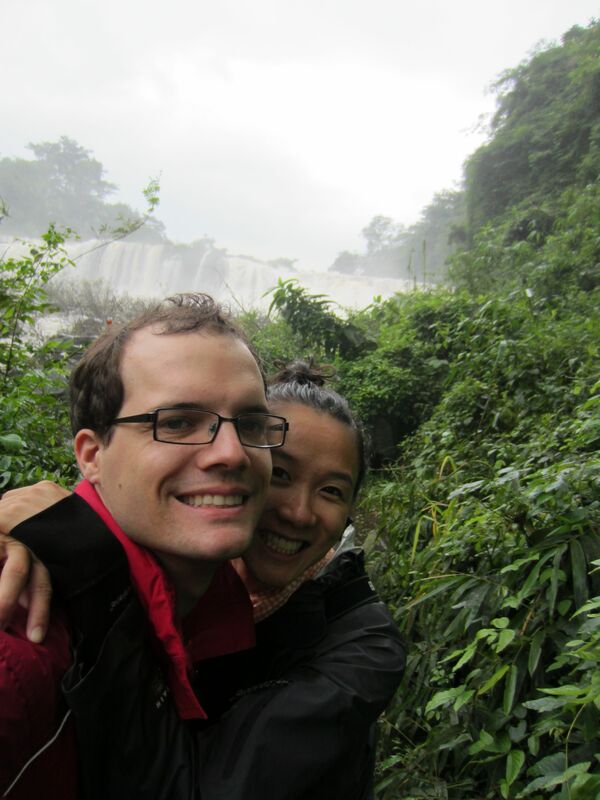 We drove first to Tad Lo and stayed in a guesthouse that was facing the waterfalls. We stayed in that red bungalow. Once again we were the only people staying there and actually, in total, we only saw 3 other travelers in the area when we went walking. The next morning, we hiked over to Tad Lo. I was so happy to find it! 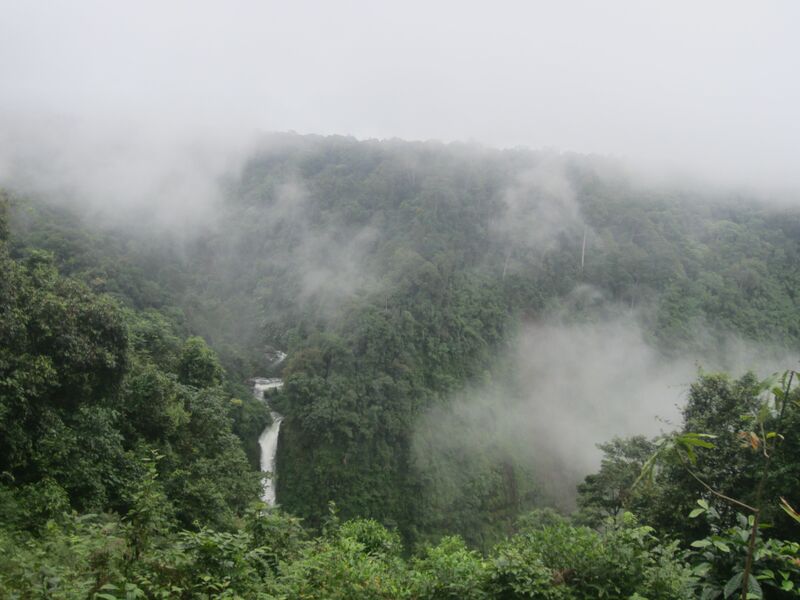 The next day, we drove through thick fog in the misty rain to our next waterfall, Tad Falls. The guidebook said this was the real attraction of the plateau. 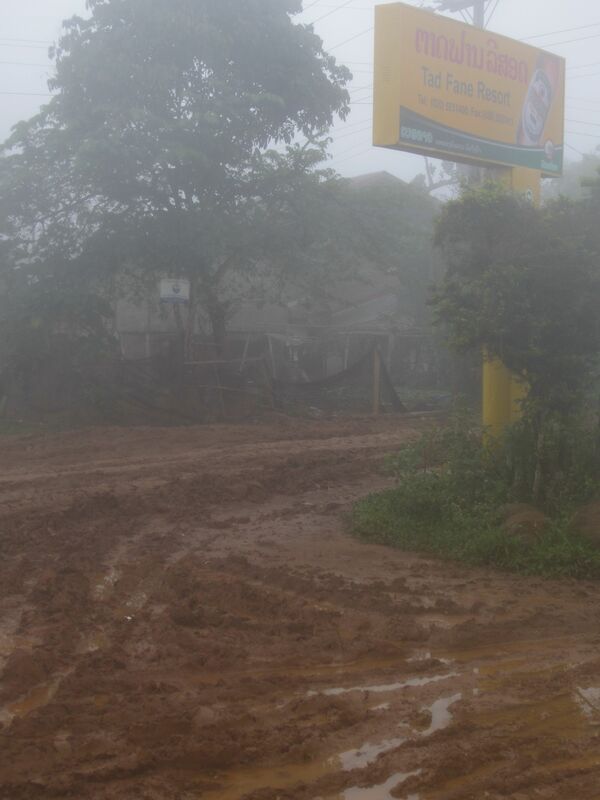 When we finally found the road to our guesthouse, we were surprised. The road was probably as slippery as wet playdoh. Christoph drove through on the dirt bike but still tipped over into the mud! It’s moments like these when I really appreciate well-designed gear. Though my boots were completely covered in mud, my feet were nice and dry. That was the muddy road to Tad Falls. It should be no surprise that we were the only guests again at our guesthouse but this time it was a bit eerie. It was really misty, there were scratchy sounds, and at one point, I saw a cow right outside of the bungalow! The reason why we trekked to stay here was because it’s built right at the waterfalls. Most of the time it was ridiculously misty but when it did clear up, we had a nice view of Tad Falls. Though the South of Laos is quite similar to Cambodia, there were strange but obvious differences. 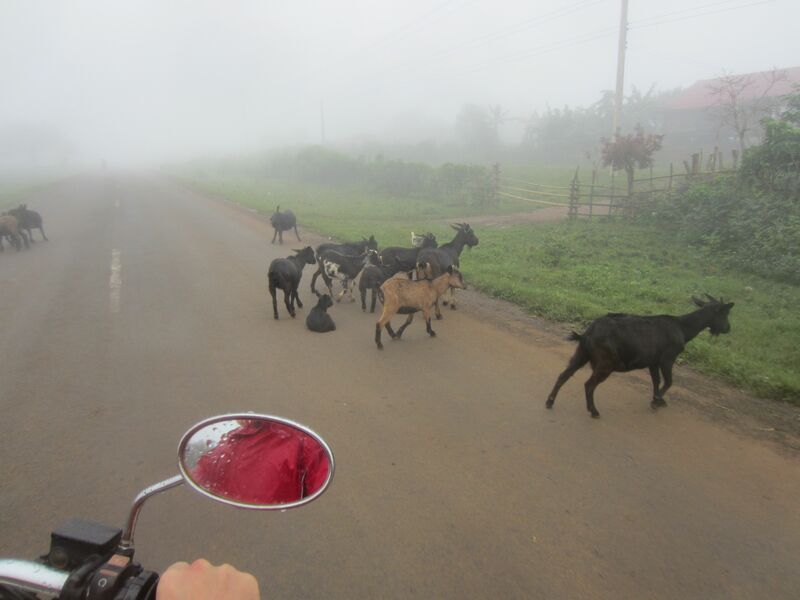 For one, we saw more variety in the livestock – pigs, goats, and different kinds of cows. That’s Christoph slowing down for the goats. Though many families have a flat screen TV, we didn’t hear them, whereas in Cambodia, everyone including the neighbors would be gathered around the blearing TV screen. We actually immediately noticed this when we crossed the Lao-Cambodia border at the end of our trip and had to wait for more passengers for the bus. The local shop was showing Tom and Jerry and the dramatic symphonies of the chase scenes were the only sounds at that empty border. Whenever I come back to Phnom Penh from traveling, I’m always reminded of the residual but profound impact of the Khmer Rouge on family life, on personal life, and individual development. Sure both Laos and Cambodia are underdeveloped and poor but somehow Cambodia has to and has not really addressed this invisible burden of its own history. The people seem to have less peace and so they never like to be alone or in silence. Nevertheless, it was nice to be home. We could understand the language again and I was so happy to have dry clothes and a warm bed! On our bus ride back, Christoph met a really nice Swiss couple who had been traveling from Russia through China and now in Cambodia. 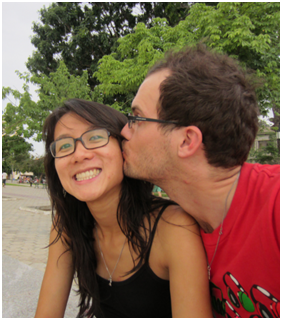 They were planning to go to Siem Reap but realized only on the bus that the route they planned for was not possible. To my surprise but not entirely unexpected, Christoph invited them to stay at his place. He has a spare room and he developed a friendship with the guy. It was actually really nice to be able to show them our home and give them a better sense of what Cambodia is like beside the typical tourist attractions. They stopped by our office to meet our staff and Christoph had some meaningful conversations about faith and justice with them too. I was proud of him for listening to his heart and showing such hospitality to these strangers. I could tell they really had a good time when they left and who knows, we might see them again in Switzerland. 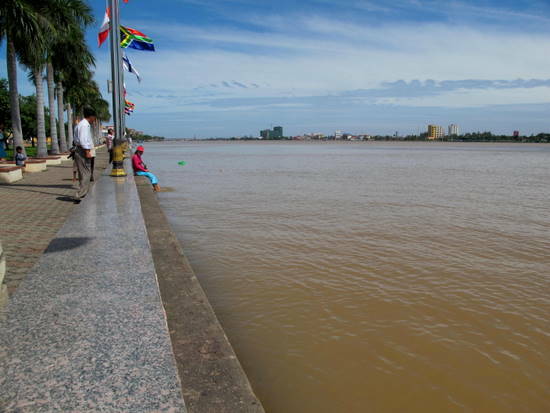 Flooding in Phnom Penh | Travelfish on Phnom Penh. Cambodia has been hard hit by flooding this year with many cities and provinces experiencing high water levels and associated fatalities. 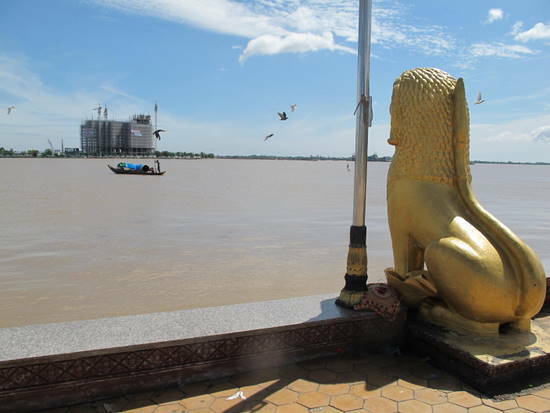 Phnom Penh is poised to be next, with the swollen Tonle Sap river threatening to flood. The Tonle Sap seems to want to meet the pavement. High waters haven’t stopped the fishermen. The flooding has presented the Cambodian government and foreign NGOs with a quandary, seeing as that this week was a public holiday for Pchum Ben — the Cambodian festival of the dead — and not an ideal time for emergency meetings or disaster preparedness. The China Daily reports that provincial governors have been asked not to leave the country on trips overseas. Despite this, response to the flooding has been…well…muted. The millions of dollars of foreign money that has gone for flood prevention seems to have had little effect. Local newspapers have taken the week off for holidays, so don’t expect to get much information there. 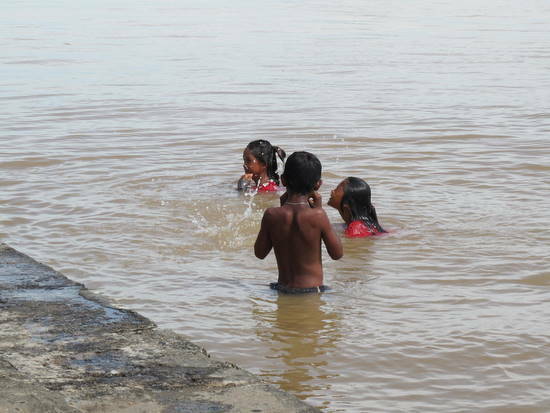 The kids don’t care, though, and are happy to take the opportunity to go for a swim wherever they can. Your flood is my swimming pool. 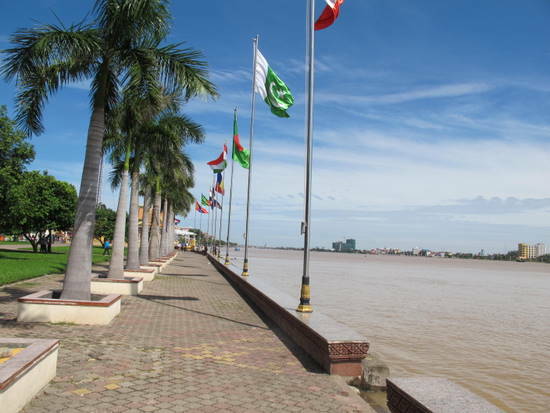 Sandbags are up around Nagaworld, where the Tonle Sap has risen to meters above its dry-season levels. The Cambodia Daily reports that suburbs of Phnom Penh that have not experienced flooding in over a decade are underwater, and that more flooding in the city is expected. 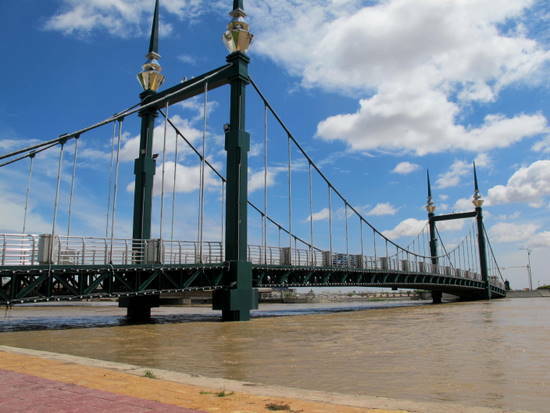 The infamous Koh Pich bridge being threatened by the river. Flights in and out of PNH are still flying on-schedule, and most buses are also running on time, albeit very packed due to the holiday. Despite the government weather warnings from the embassies of many Western countries, and a flood alarm from the Mekong River Advisory, life is going on in Phnom Penh (despite the massive Pchum Ben slowdown). Might as well go for a dunk. Social Business bildet internet-Programmierer in Kambodscha aus – Thaizeit – www.thaizeit.de. „DIE FIRMA IST MEIN ZWEITES ZUHAUSE“, SAGT PHALLA LAY. DOCH DAMIT MEINT ER NICHT, DASS ER PERMANENT ARBEITET. ER MEINT ES POSITIV. DER 24-JÄHRIGE PROGRAMMIERER UND ENTWICKLER KOMMT AM WOCHENENDE INS BÜRO, UM SEINE KOLLEGEN ZU TREFFEN, DIE GLEICHZEITIG SEINE FREUNDE SIND. SIE SPIELEN BILLARD ODER KARTEN ZUSAMMEN, SURFEN IM INTERNET UND TAUSCHEN SICH ÜBER DIE NEUESTEN TECHNOLOGIEN AUS. Lay arbeitet bei der Webagentur Web Essentials in Phnom Penh. Indem sie ihren Mitarbeitern eine zweite Heimat bieten, haben die Schweizer Firmenbesitzer Rebecca und Dominik Stankowski bereits eins ihrer wichtigsten Ziele erreicht: Es soll in dem Unternehmen, das Internetseiten vor allem für deutsche und schweizerische Kunden erstellt, nicht nur um Arbeit und Profit gehen, ums „Business“. Sondern auch um das Miteinander, das Soziale, letztlich um die Gesellschaft. Web Essentials ist ein so genanntes Social Business. Konkret heißt das zum Beispiel, dass das aus Basel stammende Unternehmerpaar zehn Prozent seines Gewinns an Nichtregierungsorganisationen spendet, dass der Profit zurück in die Firma fließt, dass die Mitarbeiter fair bezahlt und permanent weitergebildet werden, dass langfristige Partnerschaften entstehen und dass Verantwortung an die Mitarbeiter übergeht. „Unsere Idee ist es, uns selbst irgendwann überflüssig zu machen“, sagt Rebecca Stankowski mit einem Lächeln. „Wenn alle Positionen von Kambodschanern besetzt sind, gehen wir zurück in die Schweiz“. Doch das ist Zukunftsmusik. Die nächsten Jahre wollen Stankowskis, die im Januar 2008 über Jobs bei Nichtregierungsorganisationen nach Kambodscha kamen und inzwischen einen zweijährigen Sohn haben, auf jeden Fall im Land bleiben. Web Essentials existiert seit April 2010 und befindet sich noch in der Aufbauphase. Zurzeit hat die Firma 44 Mitarbeiter, darunter sind außer den Firmeninhabern noch drei Expats. „Wir haben zum Beispiel einen Schweizer Sales- und Marketing-Manager eingestellt, weil wir keinen geeigneten Kambodschaner für die Position gefunden haben“, erklärt Rebecca Stankowski. Andere Ausländer kommen für einige Monate zu Web Essentials, um Trainings in TYPO3 zu geben, der Open-Source-Software, mit der die Internetseiten programmiert werden. Ausbildung und Förderung spielen bei Web Essentials eine große Rolle: Die meisten Programmierer haben den Umgang mit TYPO3 erst in der Agentur gelernt, in einem selbst entwickelten vierwöchigen Ausbildungsprogramm. Davon profitieren auch die derzeit sieben Praktikanten – IT-Studenten am Ende des Studiums, die sich nach ihrem Abschluss Hoffnung auf eine Anstellung in der Webagentur machen können. Darüber hinaus gibt es wöchentliche Trainingseinheiten zur Weiterbildung der Mitarbeiter. „Die Ausbildung hier an den Universitäten ist weit entfernt von dem, was der Markt braucht“, sagt Rebecca Stankowski. Web Essentials verstehe sich so gesehen nicht nur als Unternehmen, sondern auch als Ausbildungsstätte, die Infrastruktur biete, Erfahrungen ermögliche und neue Techniken einführe. 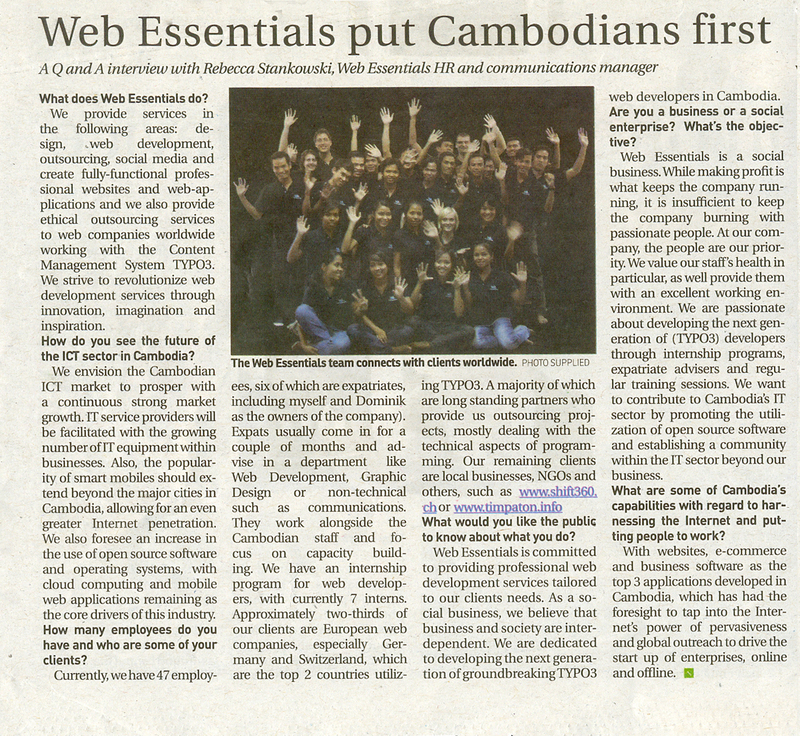 So haben ihre Mitarbeiter TYPO3, das weltweit am meisten verwendete Content Management System (CMS), ins Khmer übersetzt, wodurch wesentlich mehr Menschen vor Ort die Verwendung ermöglicht beziehungsweise vereinfacht werde. Einmal im Monat stellt die Agentur ihre Räumlichkeiten für ein TYPO3-User-Group-Treffen zur Verfügung, bei dem sich 50 bis 60 TYPO3-Programmierer und solche, die es werden wollen, austauschen. „Unser Ziel ist es, auch einen Unterschied im Land zu machen“, fasst die Chefin zusammen. Etwa ein Drittel seiner Kunden rekrutiert das junge Unternehmen in Kambodscha. Dort erstellt es Webseiten für Firmen und Nichtregierungsorganisationen, vom Design der Seite über die technische Realisierung bis zum Training der Kunden in TYPO3, um die Seite selbst zu pflegen. Die Mehrheit der Auftraggeber sitzt jedoch in Deutschland und der Schweiz: Webagenturen, die ihre Programmierarbeit in das südostasiatische Entwicklungsland outsourcen. Das sei zum einen kostengünstig und Engpässe etwa in Ferienzeiten im europäischen Sommer oder bei guter Auftragslage könnten so überbrückt werden, erklärt Rebecca Stankowski. Zum anderen schätzten die Kunden die Expertise der TYPO3-Fachleute von Web Essentials: „Unsere Leute können durchaus mit Programmierern in Deutschland und der Schweiz mithalten.“ Zwei der kambodschanischen Mitarbeiter hätten kürzlich in der Schweiz ihr TYPO3-Zertifikat erhalten. Open-Source-Programme wie TYPO3, die auf dem Open-Source-Betriebssystem Linux basieren und kostenlos aus dem Internet heruntergeladen werden können, sind in Entwicklungsländern besonders vorteilhaft. Ist die Hardware erst vorhanden, treten keine weiteren Kosten auf. Kambodschas Regierung will mittelfristig vollständig auf Open-Source-Software umstellen. Wichtige Software wie ein Betriebssystem, ein Internetbrowser, ein E-Mail-Pogramm und ein Office-Paket mit Textverarbeitung, Tabellenkalkulation, Präsentation etc. liegen bereits auf Khmer vor. Die IT-Branche Kambodschas steckt etwa im Vergleich zum großen Nachbarn Thailand noch in den Kinderschuhen. „Zurzeit geht es für lokale Firmen noch um die Frage: Warum brauche ich überhaupt eine Webseite, und nicht darum, wie sie aussehen soll“, erklärt Rebecca Stankowski. Doch sie ist sicher, dass der Markt sich entwickeln und die Nachfrage stetig steigen werde. Web Essentials mit ihren TYPO3-Experten sind dann schon da – oder besser gesagt immer noch. Unter schweizerischer oder kambodschanische Leitung. Im Besitz der Stankowskis oder derzeitiger Angestellter. Die Einzelheiten sind noch vollkommen unklar. Doch dass es weitergeht für die „soziale“ Webagentur, steht für ihre Gründer fest. Es ist wieder einmal Zeit um etwas zu erzählen. Mir ist bewusst, dass meine Schreibaktivitäten auf meinem Blog ein wenig zurück gegangen sind. Ich gebe mir die grösste Mühe, dass sich das wieder ändert. Es ist viel los. Viel Arbeit, viele Veränderungen, viele Entscheidungen. Gehen wir doch am besten mal detailliert darauf ein. Vermutlich ist es ja gar keine Neuigkeit mehr. Aber dennoch ist es der ultimative Höhepunkt der letzen 4 Monaten. Mary und ich haben uns verlobt am 5. August um etwa 00:05 Kambodschanische Zeit. Sie hat tatsächlich Ja gesagt. Wie cool ist denn das? Ich fühle mich ein wenig verwöhnt, dass meine Zeit und Arbeit hier in Kambodscha mit einer derart wundervollen Frau belohnt wird. Wir fühlen uns Wohl, auch nach diesem Entscheid. Wir spüren, dass es richtig ist und fühlen uns reich beschenkt miteinander. Ich hätte mir nie vorgestellt, dass ich auf Kambodscha reisen muss um die Frau kennen zu lernen mit der ich den Rest meines Lebens verbringen möchte. Ganz zu geschweige denn, dass diese Frau ebenfalls um den halben Globus reisen muss um mich kennenzulernen. Wir hatten eine ganz tolle Verlobungsparty in meinem Haus mit fast allen Leuten die uns wichtig sind. Aber ja… Ihr habt alle wirklich gefehlt. Und jetzt natürlich die Frage wann und wo? Wir wissen es noch nicht. Aber wir werden es euch wissen lassen, sobald wir mehr wissen. Das hängt von verschiedenen Faktoren ab, auf die ich noch genauer eingehen werde. Und jetzt ein ganz krasser Themenwechsel. Sorry, aber ich möchte chronologisch vorgehen. Obwohl ich nicht mehr mit ROOT IT zusammenarbeite, kommt Choeun oder Martin immer wieder auf mich zu und fragt mich um Rat. Und vor allem kümmere ich mich persönlich regelmässig um Bunny, den Lehrling. Bunny und ich verbringen so oft wie möglich Samstage zusammen. Wir kochen miteinander, oder ich versuche ihn zu einem Erlebnis zu motivieren. Bunny ist für seine 20 Jahre relativ depressiv. Er bevorzugt es seine Zeit in seinem Zimmer zu verbringen. Er mietet ein Zimmer für 30$ im Monat. Das ist sein monatliches Einkommen. Er teilt den Raum mit seinem Bruder. Der Bruder verdient 40$. Das muss für Essen, Schulunterlagen und den ganzen Rest reichen. Und das ist zu knapp. Bunny lehnt Unterstützung aber kategorisch ab. Von dem her versuche ich einfach Zeit mit ihm zu verbringen und ihm zwischendurch eine Freude zu machen. Bunny ist nach wie vor sehr motiviert bei ROOT IT. Aber er lernt sehr langsam und schwerfällig. Aber scheinbar macht er grosse Fortschritte wenn es darum geht Kabel zu verlegen und Netzwerke zu konfigurieren. Und übrigens, der Laptop den Bunny aus der Schweiz erhalten hat ist rege im Gebrauch. Das war das bestmögliche Geschenk. Oder fast… denn Bunny hat seit neuestem eine Freundin. Kanja. Sie ist eine Lehrtochter von Konkea, der Schneiderin. Er holt sie jeweils von der Arbeit ab und bringt sie nach Hause und holt sie wieder ab. Sie bringt Ihn ein wenig auf andere Gedanken und tut ihm sehr gut. Aber Bunny und Choeun sind nach wie vor meine grössten Sorgenkinder hier. Choeun hat sich entschieden, dass er sich vom Vocational Training Program, also von WEC zu lösen. Diese Entscheidung hat hohe Wellen geschlagen und ist auf grosses Unbehagen gestossen aber wurde akzeptiert. Martin hat es dennoch hart getroffen, weil er viele Jahre dafür investiert hat, Choeun auf den richtigen Weg zu begleiten. In der Zwischenzeit hat Choeun seine Entscheidung Bereut und versucht sich wieder bei VTP anzuschliessen. Das hängt jetzt von den anderen VTP Mitgliedern ab. Aber hier noch eine ganz schöne Nachricht: Choeuns Frau, Vannet, ist Schwanger. Sie hatte kämpft schon seit langem um eine Schwangerschaft und war auch grossem Druck der Familie ausgesetzt. Sie hat darunter gelitten, dass es nie geklappt hat und hat viel für ein Kind gebetet. Und mittlerweile ist sie im 4. Monat schwanger. Wir sind alle sehr dankbar dafür. Seit wir in Kambodscha zurück sind befassen wir uns mit der grossen Frage wie es nach Kambodscha weiter gehen soll. Mit der Hilfe eines Coaches versuchten wir über 3 Monate herauszufinden, ob wir nach unserer Kambodscha Erfahrung in die Vereinigten Staaten, in die Schweiz, in ein anderes Land? Und was zu tun dort? Wir haben uns nach Arbeitsstellen, Ausbildungsmöglichkeiten etc erkundigt. Unser Coach hilft uns, Tasks zu definieren, damit wir dem Ziel in kleinen Schritten näher kommen. Aber die Suche nach dem richtigen Ort gestaltete sich sehr schwierig. Aber das Blatt wendete sich, als uns Dominik ganz konkret anfragte, ob wir uns vorstellen könnten hier zu bleiben. Mary und ich haben uns mit dieser Frage ein paar Wochen auseinandergesetzt. Das grösste Gegenargument war, dass es finanziell schwierig wird. Auch im Anbetracht dessen, dass wir bald heiraten wollen. Hingegen wurde uns klar, dass wir bei Web Essentials wirklich am richtigen Ort sind. Ich fühle mich wohl in meinem Job. Im Verkaufsbereich lerne ich ständig dazu, mein Team entwickelt sich prächtig. Dazu stehen Mary und ich voll und ganz hinter der Mission von Web Essentials. Schlussendlich haben sich sehr viele Vorteile herauskristallisiert. Mary und ich haben uns für ein weiteres Jahr bei Web Essentials verpflichtet. Wir sind froh, dass wir die Last dieser sehr schwierigen Entscheidung los sind und sind sicher, dass wir eine gute Entscheidung gefällt haben. Hierbei vielen Dank an alle, die uns ermutigt haben, diesen Schritt zu machen und vorwärts zu gehen. Die Unterstützung aus der Schweiz ist nach wie vor riesig gross. Speziell schwierig hier in Kambodscha ist dass die meisten Leute nur befristet hier sind. Es ist ein grosses kommen und gehen. Und das “Gehen” macht uns besonders Schwierigkeiten. In den letzten Wochen haben uns einige Menschen verlassen, die uns in unserer Zeit in Kambodscha sehr wichtig geworden sind. Speziell schwierig war der Abgang von Daniel, der mit uns 3 Monate bei Web Essentials gearbeitet hat und schnell ein guter Freund geworden ist, ist vor ein paar Wochen nach Hause gegangen. Und Sven, der 8 Monate mit mir zusammen gewohnt hat ist leider auch nach Hause gegangen. Seit her ist es so ruhig am Wochenende bei mir zu hause. Draussen regnet es im Moment in Strömen. Der Monsun gibt sein bestes. Es ist Regenzeit. Das heisst, normalerweise lässt es ein Mal pro Tag so richtig runter. Das Resultat sind Strassen, die aussehen wie Flüsse. Glücklicherweise haben unsere Motorräder hier einigermassen hohe Räder. Schwierig wird’s, wenn man von einem Lexus beinahe weg gespült wird. Die produzieren höhere Wellen als ein Personenschiff auf dem Bodensee. Wie auch immer, ich hoffe dass ich mehr Zeit finde um auf meinem Blog zu schreiben. Themen gibt es mehr als genug. Wenn ihr etwas genauer wissen möchtet, lasst es mich doch wissen. Übrigens: Ich habe nun eine Schweizer Telefonnummer. +41 44 586 10 54. Ihr könnt mich nun zum Lokaltarif anrufen. Ich bin meistens erreichbar wenn bei euch Morgen ist. In meinen letzten Gesprächen habe ich festgestellt, dass es schwierig zum vorstellen, was ich genau mache zur Zeit. Darum habe ich mir gedacht, dass es an der Zeit ist Klarheit zu schaffen und ein Wenig über meine Arbeit zu erzählen. Meine Arbeit ist unter anderem der Grund, wiso meine Blogaktivität drastisch zurück gegangen ist. Ich finde nämlich kaum mehr Zeit etwas zu schreiben. Das ist allerdings ein sehr gutes Zeichen nicht? Wie ich euch in der Schweiz erzählt habe, arbeite ich für ein Social Business mit dem Namen Web Essentials. Wir sind eine Web Entwicklungs Firma. Wir produzieren hoch Qualitäts TYPO3 (http://typo3.com/about.1231.0.html) Webseiten für lokale und internationale Kunden. Aber noch viel wichtiger ist, wir bieten Outsourcing Services für Schweizer, Deutsche und andere internationale Web Unternehmen an. Outsourcing? Unternehmen, die zusätzliche Ressourcen brauchen um ihre Projekte umzusetzen wenden sich an uns. Das können ganze Webseiten sein, oder einen Teil einer Webseite, eine Funktion wie zum Beispiel einen Shop oder ganz einfach einen Fehler der behoben werden muss. Unsere Kunden sind nahmhafte TYPO3 Web Entwicklungs Firmen. Die IT-Leute oder Marketing Personen unter euch könnten sogar die einten oder anderen Kunden kennen. Spannend ist, dass wir somit mit ganz vertrauten Namen in Berührung kommen. Wir setzen Webseiten und Applikationen für Unternehmen um, die uns in der Schweiz fast täglich begegnen. Genau desswegen müssen wir auch auf dem dem entsprechenden Standart arbeiten. Dafür dass Web Essentials erst 1 ½ Jahre alt ist, haben wir schon beachtlich viele Projekte im in und Ausland durchgeführt. Bei Web Essentials arbeiten ungefähr 50 Mitarbeiter. Etwas mehr als 20 Entwickler, 3 Designer, 6 in der Administration, Kommunikation und IT Support, Ich mit meinen zwei Mitarbeiter im Verkauf und Marketing und Dominik und Rebecca in der Geschäftsleitung. Zudem haben wir 2 Raumpflegerinnen und mehrere Guards (Gehört in Kambodscha zum Standard Repetoire). Und die Belegschaft wächst. Ich selber bin für den Verkauf und die Vermarktung zuständig. In erster Linie nehme ich Anfragen von Kunden entgegen. Diese müssen analysiert und zerlegt werden damit wir sie nach Stunden schätzen können und einen Preis Vorschlag machen können. Wir treffen regelmässig lokale Kunden die an einer Web Presänz interessiert sind. Wir nehmen ihre Anliegen auf und verfassen ein Dokument, das exakt beschreibt, was der Kunde erwartet, was er erhalten wird, und zu welchen Konditionen. Und schlussendlich der Preisvoranschlag. Diese Dokumente sind sehr Zeit und Arbeits Intensiv, weil sie einfach perfekt sein müssen damit wir den Kunden überzeugen können, dass eine Webseite mit uns die richtige Entscheidung ist. Meine Mitarbeiter haben hier grosse Schwierigkeiten. Saubere Texte zu schreiben fällt ihnen schwer. Das heisst wir müssen zusammen durch jedes Dokument lesen und Korrekturen anbringen und auch erklären wiso etwas anders geschrieben werden muss. Das Ziel ist, dass wir am Schluss nur noch die Grammatik korrigieren müssen. Wir entwickeln eine Verkaufsstrategie wie wir potentielle Kunden von einer guten Website überzeugen können (Verkaufs Präsentation, cold calls, Kostenvoranschläge etc). Und erarbeiten Marketing Stategien, wie wir weitere Partner auf Europäischem Boden finden können. Des weiteren kümmere ich mich auch darum, dass die Projekte sauber gestartet und kommuniziert werden. Ich bin für die Kundenkommunikation verantwortlich, zum Beispiel wenn der Kunde nicht zufrieden ist oder noch zusätzliche Anforderungen hat. Ausserdem müssen wir sicher stellen, dass alle Rechnungen versendet werden. Ich werde mehr über Web Essentials schreiben in einem nächsten Bericht. Wenn ihr Fragen habt, lasst es mich wissen. Dieses Mal auf der Diamond Island. Der Tägliche Wahnsinn. Aber fangen wir mal mit einer einfachen Übung an. Leider noch mit dem alten Bild. Aber halb so schlimm ;) Klick aufs Bild für eine grössere Ansicht.